8-bit styled games have been making a comeback recently; game developers who grew up with the NES want to pay homage to their favorite games they loved as a kid. If you saw the first episode of our new podcast, you’ll see that Yacht Club Games are one of these types of game developers. With more and more 8-bit games making a comeback, you are bound to run into some garbage. You’re also going to run into some true gems, and Shovel Knight is one of the true gems in this case. You play as the brave Shovel Knight, and you are off to defeat the Enchantress and save your friend. You’ll run into many enemies, all part of “The Order of No Quarter” all out to get you. The story isn’t that important in the outlook of this game, because the gameplay is just really good. Before that, lets start with the graphics/music. The graphics are on the higher quality end of pixel art games, and the music is fantastic; Yacht Club Games outdid themselves with an amazing soundtrack that fits the game and is upbeat, perfect for an action game like Shovel Knight. I put it towards the top of my list of 8-bit/8-bit styled game soundtracks; it’s really that good. To sum up the gameplay, it’s half platforming and half fighting enemies. The gameplay kind of feels like a classic NES action game; you’ll run into many enemies, and a boss is at the end. The bosses show up like Mega Man bosses; it’s hard to explain what that means in words, but I think any classic Mega Man fan knows what I mean. It’s hard to fit all the power-ups into a decent length review, so I’ll keep it short. There are relics that let you use certain abilities such as a fireball you can shoot at enemies, or activating temporary invincibility. These power-ups take up magic to use them, and if you don’t have enough magic available you can’t use it. You can collect a power called “ichors” that give you different abilities, such as restoring all of your health and magic, or attracting treasure to Shovel Knight for a limited amount of time. Speaking of treasure, I have my first thing to complain about. Treasure is important to keep, and not lose. Yes, you can lose treasure, and you can lose a lot of it if you’re not careful. If you die in any way, you will lose up to three bags of gold. Combined it’s usually worth from a quarter to half of your gold before you died. However you can retrieve these bags that appear where you died. That is if you don’t die again before you get there. That brings me to my next point: Shovel Knight can be really hard at times, just like the 8-bit games that coined the term “Nintendo hard” but it’s not entirely brutal to the point where it’s impossible. If you come to grips with the fact that you’ll probably die at least once per level, you won’t feel that Shovel Knight is unfair. Luckily there are multiple checkpoints throughout the level, so you don’t have to worry too much about it. The problem with losing treasure is that you need to acquire treasure to get these power ups, and the power up I most focused on was increasing Shovel Knight’s life meter. You will lose more health later in the game, so it is necessary to improve your health meter as the game progresses. If you lose too much treasure you might not have enough to buy a new power up that you may desperately need. 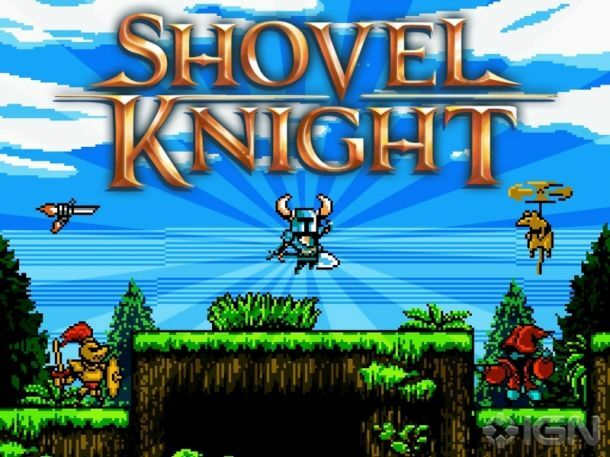 Shovel Knight is difficult; and it should be, after all it represents the 8-bit era, and those games were as hard or harder than Shovel Knight. You’ll have a blast with this 8-bit game, and unless you only like easy games, pick this fine indie game up today. Superb review! Thanks for helping us provide quality content to our viewers. I was just wondering when this was ever going to hit lol. It's the version I went with since I thought I would get the most play time out of it. Nice review and couldn't agree more! @Tech101 wrote: I was just wondering when this was ever going to hit lol. It's the version I went with since I thought I would get the most play time out of it. @Gamergy fell ill for awhile, but he's doing better now. Great review, my friend. I'm just wondering why you didn't include any specific details about the 3DS' 3D effect. That would've set it apart from the other Shovel Knight review on WiiWareWave. I'm sure the retro graphics look much better on the smaller screen too. 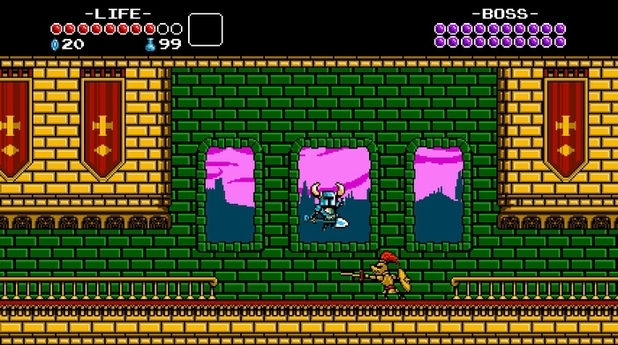 Even though Shovel Knight on the WiiU is presented in HD, the resolution is the same in both versions. @Tech, that's was the right choice, my friend. If I want to play a retro game, I'll just play one of my VC games. I'm tired of plain-old retro graphics in recent indie games. That's why I downloaded Mutant Mudds & Cave Story, and more recently, 1001 Spikes & Shovel Knight onto my 3DS. The 3D effect really makes the retro graphics pop-out and they're much more interesting to look at. @Nintenbro82 I can't believe I left out the 3D effects. I think it has just enough 3D where it sets it apart from other versions, but doesn't try too hard. It's like the icing on the cake for Shovel Knight's graphics, something that isn't needed for the game itself but is nice to have anyway. Awesome review! This game is incredible guys so download it if you haven't already. Shovel Knight is awesome! Nice review man. This is a great review and I completely agree with everything written in the review! I watched the GPLP of Shovel Knight on YouTube. It looks immensely difficult, and yet the music is so good. I don't like playing overly-challenging games, but I don't want to miss out on the music. GamerZack87 wrote: I watched the GPLP of Shovel Knight on YouTube. It looks immensely difficult, and yet the music is so good. I don't like playing overly-challenging games, but I don't want to miss out on the music. The game isn't that difficult. It's actually easier than most Mega Man games imho. Which is why I've never actually beaten a Mega Man game. I've only beaten Mega Man 9 "barely" and 10 through normal means, but I had no problem beating Shovel Knight.